Teide is an active volcano on the island of Tenerife (Canary Islands, Spain). The volcano is 3,718 meters above sea level. It is the highest mountain in Spain and any island in the Atlantic Ocean. It is 7,500 meters above the ocean floor, it is the third largest volcano in the world from its base. Located in the Teide National Park declared in 2007 as a World Heritage Site by UNESCO. ↑ Lunar and Planetary Institute, "Pico de Teide, Tenerife"; retrieved 2012-6-15. 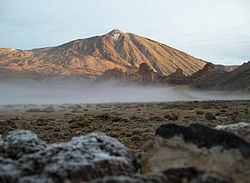 ↑ UNESCO, "Teide National Park"; retrieved 2012-6-15. This page was last changed on 27 April 2017, at 16:46.